Spoil alert! OK, let's start this off with what I enjoyed the most about this story. Personally, I think that the part where Harry makes up with Ron again after he gets the most points in the first task of the Triwizard Tournament (I'll explain what it is). Oh, btw, Ron is Harry's best friend. The second thing is my favourite character from the story: probably Hermione. That is weird because I like Hermione, but she's never normally my favourite character of the books. But I have to give her credit this time and she does give up some of her time to help Harry win the Triwizard Tournament and she still gets excellent marks in all areas, apart from Divination, in her school work. She's also a good friend, and gives Harry and Ron support when they're going through difficult times. Moving on after that long detour on Hermione. Here, I'm going in depth about the Triwizard Tournament. It's a Tournament that 3 of the most popular wizarding schools compete in; Hogwarts, Beauxbatons and Durmstrang. Beauxbatons is a French school and Durmstarng is in Belgium (I think). Anyway, there are 3 tasks, hence the name Triwizard, and it's decided by an impartial judge (The Goblet of Fire) 1 person from each school to compete. Normally, anyone could write their name down on a slip of parchment and put it inside the Goblet but in Harry's year, only 17+ are allowed. The prize of the Tournament is 1000 galleons! Galleons are wizard money. But I won't say any more now or else I might talk about the whole story. Thanks for reading if you got this far!!!!! I would recommend it to people who like magic and dragons. My favourite character was Harry Potter. It interested me with the Triwizard tournament. It was sssssoooo interesting. I think its the best out of all the harry potter books i read. Awesome book. Couldn't get out of it for 4 hours straight! 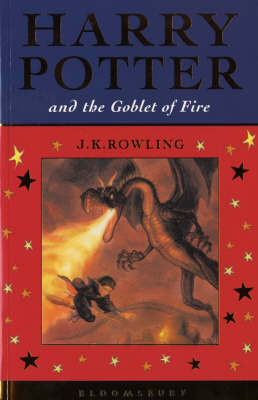 This book is about a boy whose name was in the goblet of fire. The main characters are Harry Potter, Hermione Granger, Ronald Weasley, Cedric Diggory, Alastor Moody, Victor Krum and Fler Delecore. This story is a fairy tale. Harry Potter is in a challenge with dragons and mermaids and in the end, the dark lord who killed his parents and vanished, arrives again. My favorite part is when Harry, Hermione, Ron and the rest of the Weasleys go to the quittich World Cup. Harry is a wizard and escaped Lord Voldermort a third time. I really liked this story because I like the way how it's written and I like magic and witches. All harry potter books r amazing to me I hope that u think the same if u havn't read any of them then try it id recommend being about 9 or 10 before reading. It was really good. I liked when he did the first task and came second place in it. I also liked when he saw his named called out by Dumbledore. I was quite scared when Mad-eye Moody turned Barty Crouch’s son. I love Harry Potter this is one of my favourite in the series because it has loads of action and the story starts to unfold, my favourite character in this book is Fred and George because they are so funny.